AMC released two first look photos from the set of Better Call Saul today during the Television Critics Association (TCA) Press Tour. The series is currently shooting Season 2 in Albuquerque, NM and is set to debut early next year on AMC. 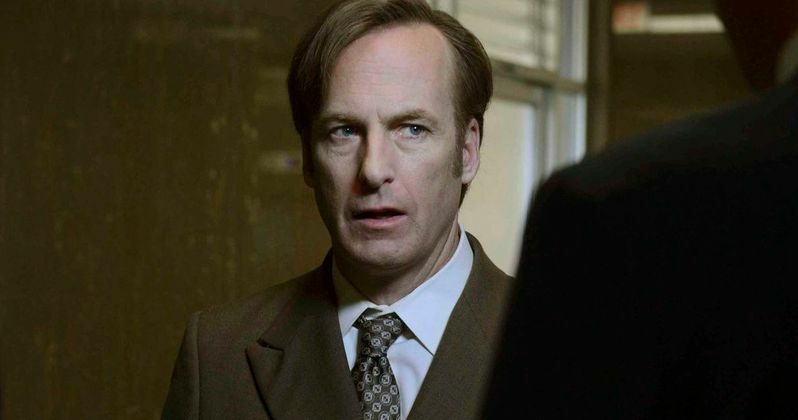 The first photo features series star Bob Odenkirk as Saul Goodman, who is being confronted by two unspecified characters. The second photo features series creators and executive producers Vince Gilligan and Peter Gould on the set. The series' first season was recently recognized with seven Primetime Emmy Award nominations, including Outstanding Drama Series, Outstanding Lead Actor in a Drama Series (Bob Odenkirk), Outstanding Supporting Actor in a Drama Series (Jonathan Banks) and Outstanding Writing for a Drama Series, among others. Better Call Saul, which tracks small-time lawyer Jimmy McGill's transformation into a man who puts the criminal in "criminal lawyer," is executive produced by Vince Gilligan, Peter Gould, Mark Johnson and Melissa Bernstein and stars Bob Odenkirk as Jimmy McGill, Jonathan Banks as Mike Erhmantraut, Michael McKean as Chuck McGill, Rhea Seehorn as Kim Wexler, Patrick Fabian as Howard Hamlin and Michael Mando as Nacho Varga. Ever since Better Call Saul was announced, fans have wondered when Breaking Bad stars such as Bryan Cranston and Aaron Paul will be incorporated into the series. Series creator Vince Gilligan revealed last month that Bryan Cranston's Walter White may come back after Season 2. Aaron Paul also teased earlier this year that he has had discussions with the producers about reprising his role as Jesse Pinkman, although he isn't exactly sure when that will happen. If AMC orders a third season, it won't be too surprising if both of these iconic characters come back. The Breaking Bad spinoff debuted in February, recording the most-watched series premiere in cable TV history, pulling in 6.9 million viewers overall, and 4.4 million viewers in the coveted 18-49 demographic. The series is largely set several years before the events of Breaking Bad, but there were certain scenes in the show that flash-forwarded past the Breaking Bad series finale. These scenes showed that Saul Goodman has changed his name to Gene, and is working at a Cinnabon in Omaha, Nebraska, but it's unclear if we'll see more of Gene in the second season. AMC has yet to announce a premiere date for Season 2 of Better Call Saul, but we'll be sure to keep you posted with more updates as soon as they come in. Do you think Walter White and Jesse Pinkman should show up this season? Or is it too soon? Check out the photos and let us know what you think should happen in Season 2 of Better Call Saul.